A new paper published in Quaternary Science Reviews reconstructs the size of four glaciers in Norway over the past 10,000 years and shows all four were considerably smaller than the present during the Holocene Climate Optimum between ∼8000 and 5500 years ago, as well as during the Roman and Egyptian warming periods 2000-3000 years ago. The paper finds the Little Ice Age [LIA] was the coldest period with the largest glacier extent of the past 10,000 years. Note: The estimated cooling during the LIA was 1.5 °C, but the globe has only recovered 0.7°C since the end of the LIA in ~1850. Evaluate sedimentation regimes detected by means of multivariate statistics. Present glacier variability using physical sediment properties from lake sediments. Combine chronological uncertainties with uncertainties of glacier activity. Reconstruct details of glacier fluctuations during the 8.2 ka event. Here we present a Holocene record of glacier variability as documented through physical sediment properties analysed on sediments from the distal glacier-fed Lake Nedre (Nedre = Lower) Sørsendalsvatn (918 m a.s.l. ), located 35 km inland from the coast in western Norway. We emphasise comparing different sediment parameters by means of statistical methods as well as integrating chronological uncertainties along with uncertainties of reconstructed glacier variability. A multi-proxy data set consisting of sedimentological, physical, and geochemical data shows one main process, as extracted by means of principal component analysis (88% of the variance explained by the first PC), driving sediment variability in Nedre Sørsendalsvatn. 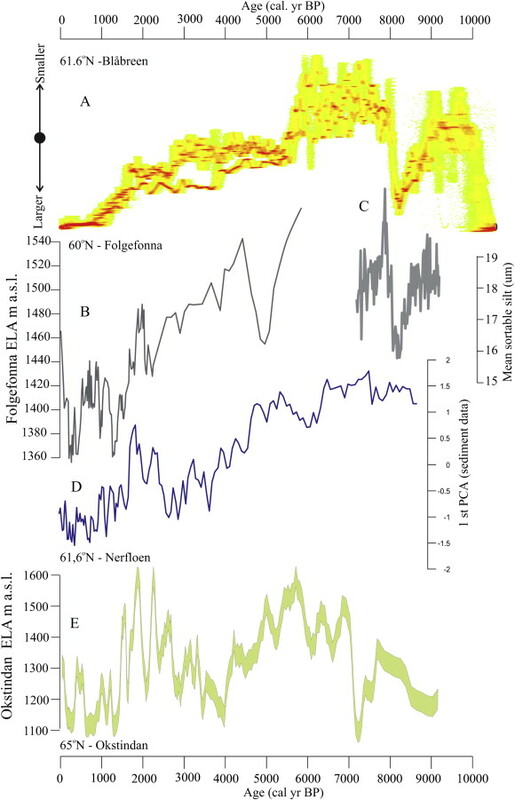 The common signal extracted from the sediment data is indicative of glacial activity in the catchment and is interpreted to vary in concert with the changing glacier equilibrium-line altitude. The reconstruction of former glacier activity is in accordance with glacier variability reconstructed from other sites in western Norway, including the termination of the deglaciation at approximately 10,000 cal yr BP, the 8.2 ka BP (Finse) event, the Holocene thermal optimum between ∼8000 and 5500 cal yr BP, and the onset of the Neoglacial at 5500 cal yr BP. The largest glacial extent during the Neoglacial time period took place during the ‘Little Ice Age’. The combined radiocarbon chronologies from three different sediment cores provide insight into the duration of the “8.2 ka event” in the terrestrial system. The maximum glacier activity at approximately 8.2 cal BP is the culmination of a glacier advance that began around 9 cal BP [9,000 years before the present] and accelerated at 8.4 cal BP [8,400 years before the present] . The glacier advance ended abruptly at 8.0 cal BP [8,000 years before the present]. They can't check the facts because they don't fit their propaganda template. This is about political science not climate science - which by the way is far from "settled" except in rich man Algore's mind.